At the time of writing, this boxed set is available only in the Americas - according to the main Naxos website, that is. At Naxosdirect it can be purchased post-free in the UK for a very attractive £12.99, and the other usual non-American websites seem to be stocking it too. 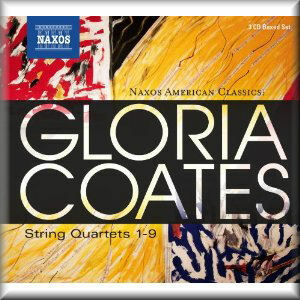 Whatever the situation though, all Naxos have done for this set is literally to take three previous releases (2002-2010) of Gloria Coates's first nine String Quartets and stick them in a shiny black-and-yellow card package for a discounted price. The idea is sound if Coates writes no further Quartets, or several; but what if she were to write only one more? In fact, Kreutzer violinist Mihailo Trandafilovski's website reported in autumn 2012 that the ensemble had just recorded a new quartet by Coates entitled 'Among the Asteroids', to appear on John Zorn's 'Tzadik' label. It is actually difficult to find up-to-date information on Coates on the internet or anywhere else. Her entry in New Grove is, rather shamefully, more than a decade out of date. Nevertheless, if she has half the career Elliott Carter had, there may be more quartets to come. At any rate, if anyone's music deserves to be flagged afresh until the unique talent of its composer is widely recognised, it is Coates's. There has almost certainly been no greater female symphonist than she - a fact acknowledged by American opinion-guru Kyle Gann in his notes. There are few males that could rival her in symphonic writing for total originality or, indeed, masculine muscle. Her string quartets represent a parallel body of works, the unique character and expressive power of which has seldom been matched. As Skærved says in his note on Coates's music in 8.559666: "Once the floodgates are open, its extraordinary beauty is irresistible." It is not a beauty that all listeners will acknowledge, certainly not on the strength of a single audition. To appreciate fully the complexity, intensity and profundity of these works, concentrated and repeated listening is a prerequisite. For newcomers, it is ironically the Sonata for Solo Violin and the Lyric Suite for piano trio that provide the easiest point of entry. In the former can be felt the presence of Johann Sebastian Bach, whom Coates has previously cited as her greatest influence. Despite a few unusual sound effects, this is attractive, lyrical writing. There are more odd sounds in the seven-movement Lyric Suite - the pianist must play both the outside and inside the piano - and dissonance, yet predecessors like Charles Ives, and certainly Henry Cowell, would feel at home in this world. Spanning more than forty years, the nine String Quartets heard here are considerably more challenging, although not in a Sixties-Penderecki way. The First and Second are only a few minutes in length, and, despite their origin in the heyday of modernism are relatively accessible. The Third and Fourth are only a little longer and thus fairly easy to negotiate, although by this time Coates's unique style is prominent. Dense, multi-minute, often palindromic glissandos and scordaturas - with performers often retuning whilst playing - are trademarks not only of Coates's quartets, but of the symphonies too. Other unusual effects do recall Penderecki, but with Coates they are more subtly employed, in a musical language that has been called 'post-minimalist'. In every case the result is a soundscape of startling, unsettling intensity of colour and texture. Their eerie, fifth-dimension nature has even led to movements from two of Coates's works being used by Naxos on their pair of 'Music for the Zombie Apocalypse' digital albums (9.00117, 9.00148). Half the Kreutzer Quartet's personnel changed between the second and third volumes, with Gordon McKay and Bridget Carey making way for Mihailo Trandafilovski and Morgan Goff respectively. Yet whoever the instrumentalists, their concentration, commitment and technique are extraordinary in what on the page appears extremely daunting music. Sound quality is very good, although recorded volume is amazingly low - it might easily have been tripled by the engineers without ill effect. Kyle Gann has written insightful and detailed booklets notes for all three volumes. He clearly appreciates the significance of Gloria Coates's music. The individual discs all carry as a bonus a print-in-miniature on the front page of her expressionist paintings, providing a glimpse of another aspect of her artistic nature. Coates is indeed one of the most important and prolific female composers of the 20th and 21st centuries, and Naxos deserve plaudits once again for having the nerve to bring her works to the attention of a wider public. Or rather, attempt to bring: few in a world all but lost to pop are ever likely to hear this music, let alone understand it. Their loss.